PenDance requires that address lists and guest lists in be provided to us in spreadsheet format. We’ll merge the spreadsheet into our templates for either hand calligraphy or computer printing, then send back your list in label format so that you can review it for errors before we start addressing. You can sign up on our Home page to receive our Free Guide for Brides-to-Be which will explain the etiquette rules for addressing envelopes. You will be able to catch errors or omissions more easily when you see it in label format. 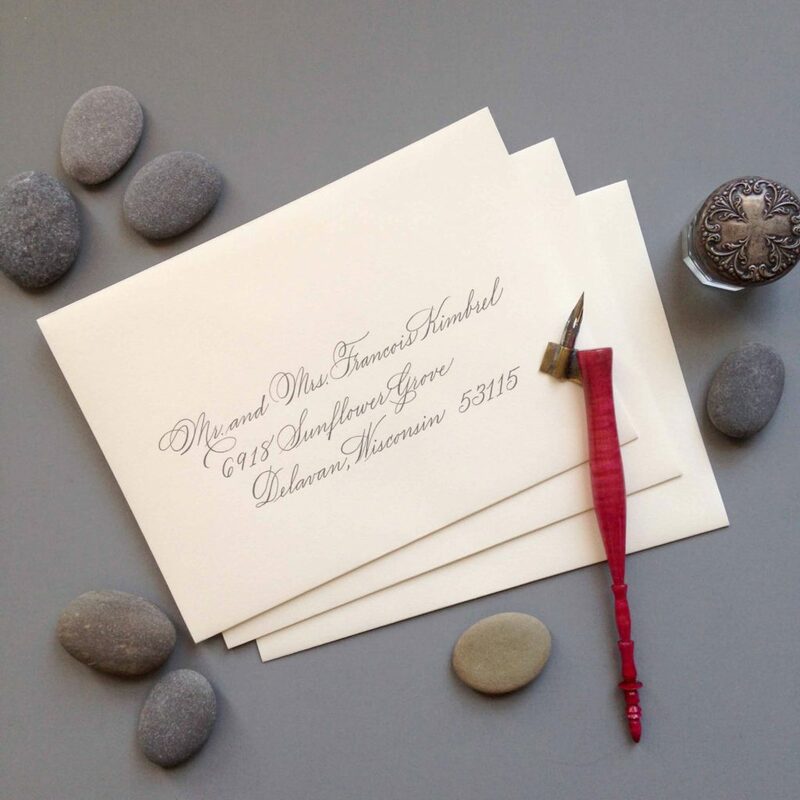 It’s easier for the calligrapher to visualize how the addresses should look on the envelopes. Proofreading is more efficient when the addresses appear exactly the same on the list as on the envelopes. If you would like to use PenDance’s Excel template to prepare your address list, you can download it here. If you prefer that your out-of-town guests’ envelopes be addressed first, sort them to the top of the list. If you have a “B” list, sort them to appear at the end of your list. Alphabetize the list by last name, if possible. If you need to add additional names or make changes to your list after sending us the original list, please email ONLY the changes, NOT the entire list over again. If we have to process additional spreadsheets an administrative fee will apply each time. Spell out Number or Apartment. “Apartment Number” is redundant. Include punctuation for titles such as Mr. and Mrs. There is no period after “Miss”. Spell out postal and state abbreviations (Post Office Box, Boulevard, Avenue, Lane, etc.). Zip codes can be 5-digits for USA addresses. Married couples with different last names are noted with “and” between their names and their names appear on separate lines. Unmarried couples’ names are not joined with “and” and their names appear on separate lines as well. Inner envelope names should be in separate columns on your spreadsheet. Indicate whether or not the “G” in “Guest” should be capitalized (or not), and whether or not the “F” in “Family” should be capitalized. You can spell out “Doctor” for medical doctors. If you have any questions about formatting your list, please contact us!